City officials are asking Boston residents to reach out for resources in an effort to combat a recent surge in violence. Mayor Marty Walsh and Police Commissioner William Gross were among those who spoke at a Friday afternoon press conference at the BCYF Tobin Community Center in Roxbury after officials with city agencies met to discuss the next steps forward following last weekend's shootings, which claimed the lives of six people in three separate shootings in various neighborhoods. Cynthia Creighton's son, Raymond, was the first to die. He was gunned down on Massachusetts Avenue Friday morning. The 26-year-old left behind a wife and son, and now his mother wants to know what happened. "Somebody took his life and somebody hasn't been caught yet," she said. "As a mother, I need more answers than what they just said." 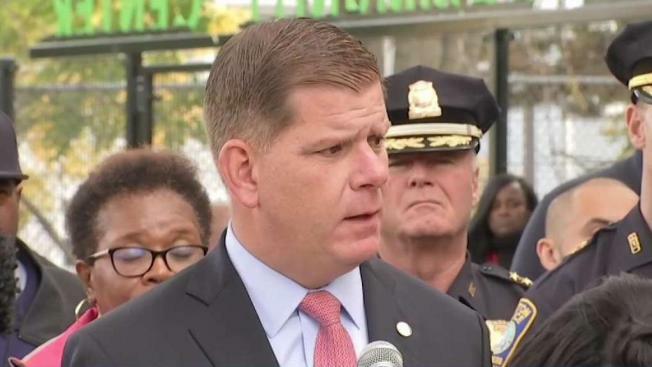 Boston Mayor Marty Walsh and Police Commissioner William Gross spoke out Friday on the recent surge in violence in the city. Creighton says her grandson turns one next week, and she's heartbroken her son won't be alive to see it. Investigators previously said the shootings were not connected. Two suspects have been arrested so far in connection with the separate incidents. Meanwhile, police are also investigating Thursday's fatal shooting of a 19-year-old in Dorchester, which marked the 45th homicide this year in the city. "As I've said before, you can't arrest our way out of what's happening in the city," Walsh said. "We will arrest people that do bad things, but what we'd like to do is get them before they do a bad thing and put them on a path to success." Walsh asked residents to keep an eye out for those who may be struggling and let them know there are city agency resources available for them to use. Gross said he understands the need for the families of victims and communities to feel a sense of justice. "Only when we're working together as a unified front can we prevent more homicides and senseless acts of violence," he said. Community members say the crimes should have never happened, and they're now working more closely with police to come up with ways to reduce violence. "Whenever we have to have a press conference like this, whenever we have to talk about this it becomes a difficult moment for us," Mona Lisa Smith, president of Mothers for Justice and Equality, said. "But we have to unite as a community and begin to think about what is it we need to do to get these guns off the street."